You can keep your 4K TVs and your autonomous puppy dog drones. The Belty promises to have a greater impact on humanity than even the wheel. 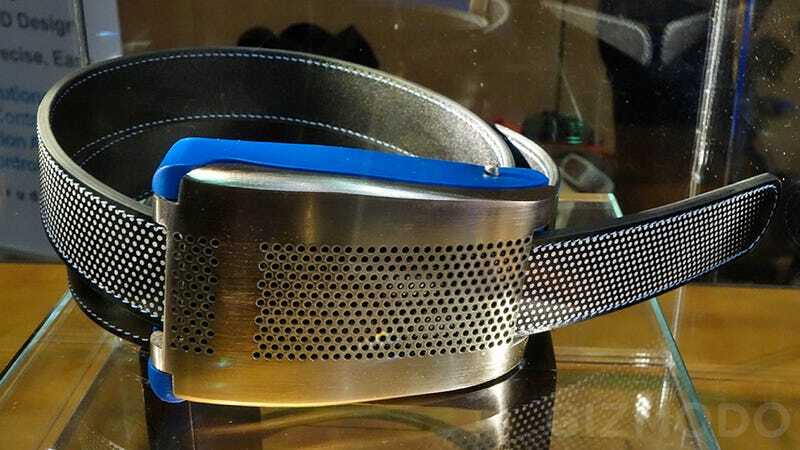 It's the world's first smart belt featuring an electric-powered motor built into the buckle that automatically loosens the strap when you sit down, and then tightens the belt again when you stand up to head off any Benny Hill-esque pant droppings. The creators of the Belty, a company called Emiota, aren't sharing pricing details or an exact release date yet, but they're hopeful the belt and buckle combo will hit the market later this year. Made in France with fancy leathers so it makes an even bigger fashion statement than just having a huge buckle under your belly, the Belty wirelessly connects to a smartphone app so you can teach it your preferred level of tight and loose, but further tweak how far it can expand during dining emergencies.